GUANGZHOU -- Typhoon Neoguri on Saturday hit south China's Guangdong Province with heavy rains and strong winds, but no casualties have been reported, local authorities said. As the typhoon is weakening, the storm surge warning was lifted at around 5 p.m. by the State Oceanic Administration's South China Sea Marine Prediction Center. But heavy rain is expected in the Pearl River Delta and eastern Guangdong in the following days, according to the meteorological station of Guangzhou city, Guangdong Province. 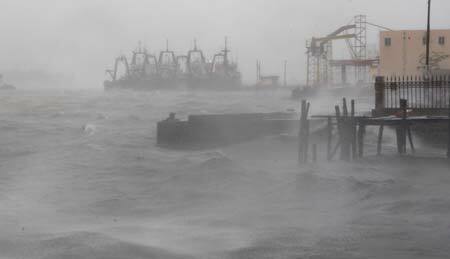 The typhoon generated winds of up to 50 to 61 kilometers per hour when landing, the station said. It brought heavy rain to many parts of Guangdong, including Shangchuang Island with more than 260 millimeters of rainfall per hour, and many towns in western Guangdong with more than 100 millimeters, said Lin Liangxun, chief weatherman of the station. The government called 48,358 fishermen and marine workers to return to land and evacuated 10,551 people in coastal cities, according to the Guangdong Provincial Flood Control and Drought Relief Headquarters. Maritime safety administrations in Guangzhou, Yangjiang and Maoming cities saved 210 fishermen stranded on the sea on Saturday, according to the headquarters. The local government has strengthened efforts to ensure reservoir safety and prepare for landslides. The first typhoon in south China this year landed at Dongping Town, Yangdong County of Guangdong Province at 2:15 p.m., after a Friday landfall at Longlou Town, Wenchang City, in the northeast of the island province of Hainan. The Maritime Safety Administration Bureau of Hainan Province allowed shipping services across the Qiongzhou Strait to resume at 11:40 a.m. on Saturday, declaring the passage safe. Eighteen fishermen are missing and 42,000 Hainan residents have been relocated since Neoguri struck.